As a Science teacher I am well-acquainted with the idea of students working as partners in a lab setting. It’s a time-honored practice based on a variety of rationales, depending on the setting. Lab partners, or indeed partners in any academic setting, might be placed together for logistical reasons: there may be multiple responsibilities that need to be shared, there may be limited equipment, limited lab supplies, limited computers, or limited space. There may be pedagogical reasons as well: students can assist each other in learning material, or learning to work together may even be the goal of the lesson. In computer programming classes, “pair programming” may be used, with one student typically “driving” (entering code on the computer), and another “navigating” (dictating code, catching typos, etc.) There are variations on the specific responsibilities of each role, but the general idea is that two heads are better than one, and that an ongoing conversation as the code is developed will produce a stronger product. Pair Programming isn’t just for classes–it’s actually used in the software industry by some organizations. 1. Introduce the idea of Paired Work. Discuss the benefits and talk about the challenges. Mention the fact that there may be different roles to be played, and that those roles will likely change over the course of the experience. Point out that people need to be on their best behavior when working as a pair. Respect is an important part of this process, and that includes during that first moment when you learn who you’re going to be working with. A loud cry of “Oh, man, I got stuck with Christine?? !” doesn’t get you off to a great start, and celebrating that you got paired with the person with the highest test average isn’t appropriate either. Code.org’s video on Pair Programming, while a bit cheesy and clearly intended for a more Middle School audience, pretty much nails it. 3. Explain the Pairing process. Very often I’ll use this computer program to pair students randomly. They’ve come to appreciate the excitement of finding out who they’re going to be working with. In the case of Pair Programming, I’ll be very specific. Just before running the program so that students can see the results on the overhead projector, I’ll say that the partner listed on the left side of list will be the first “driver,” and that students will be using that person’s computer for the project. The person listed on the right side of the list will be the navigator, and will get up and move over to where the driver is sitting to get started. to a series of groups of a specified size. 5. At an opportune time, have students exchange roles. During every assignment, assuming I’ve done a good job of building in an unexpected challenge or new idea, I’ll ask for attention: “Hands off the keyboard!” or something similar. I’ll pose a question regarding the work that they’ve done, or share some observations I’ve made, or ask if anyone has come across the difficulty that I’ll expect they’re going to have. After this brief interruption, I’ll ask them to change roles and continue their work. Sometimes the process doesn’t work quite right the first time, or there may be mid-course corrections required if students get a little sloppy in their treatment of each other. That can happen in any classroom environment. The fact that students are truly randomly assigned, however, seems to keep them on their best behavior. They know that I don’t have any intentions in assigning them to a given partner–this is just who they’re going to be working with today. Here’s a video clip of my students working on a programming assignment in a Paired environment. Overall, I’ve been very pleased with how this process has worked with my students over time. Give it a try in your classroom and see what you think! I try to encourage my students to keep a paper-based notebook for their work in my computer science courses. I think there’s a benefit to taking notes by hand (when appropriate), and there are handouts, worksheets, paper copies of problems that I have them do by hand, and printouts of project specifications. Most of this is available on the website I keep for the students as well, but there’s something different about paper. You interact with it in a way that you can’t with a keyboard. I’ve never really been into the idea of doing a lot of “crafting” in my classes, however. Paper, glue, tape, pencil sharpeners, colored markers, scissors, string… It all sounds very middle school (no offense to my colleagues there), and don’t even get my started on all those teacher meetings where we have to wander around the room, putting up stupid colored Post-Its everywhere. I really hate that stuff. Last year, though, a roll of butcher paper found its way into my possession, and I stuck a ring stand through it and set it off to the side in my computer science class. 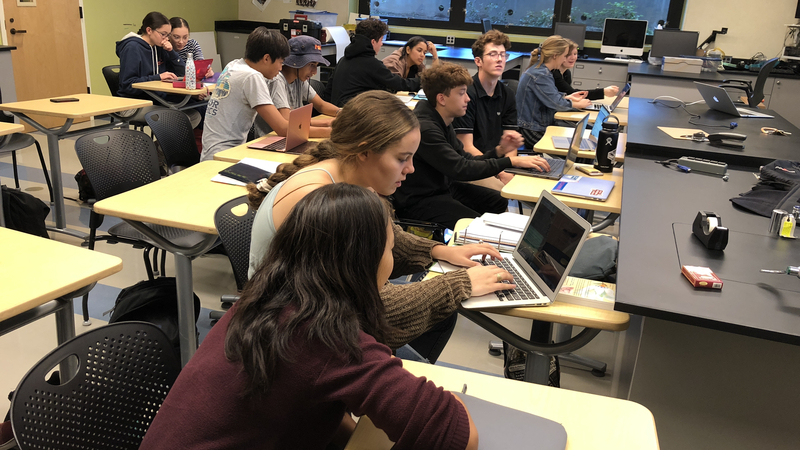 Recently I’d started to feel like there was a sizable number of students in my CS courses who were watching what I was doing on the board/screen, but they weren’t getting to write, to draw, to interact with the material the same way even that students in my AP Physics class work with ideas. I decided I’d find a good opportunity to see if I could change that. “Zookeeper” is a project in my AP Computer Science class that is designed to give students the opportunity to explore inheritance, creating an Animal superclass and a few subclasses that inherit from it. Object-oriented design asks one to consider data objects in terms of instance variables, and accessor and mutator methods. Every year I ask students to get together in small groups to consider their classes in some detail before jumping on to the keyboard. This year I asked them to draw diagrams of their classes on the butcher paper. It took a bit longer–I was surprised how much time it takes for someone to figure out how to tear off a piece of paper from a roll–and the result diagrams weren’t necessarily *artistic*, but that was beside the point. Being able to wrestle with the concept with paper and Sharpies resulted in projects that clearly demonstrated a greater facility with the concept of inheritance. In the post-AP Advanced Topics class, we’ve just learned about binary heaps, a strategy for prioritizing items in what would otherwise be a standard First In-First Out queue. Here, optimized strategies for adding an item to the heap consist of placing it at the bottom and having it “percolate” up, while deleting an item from the top of the heap involves percolating down… and writing code to implement these strategies is hopeless without a solid qualitative understanding of the process. Bring out the office supplies. 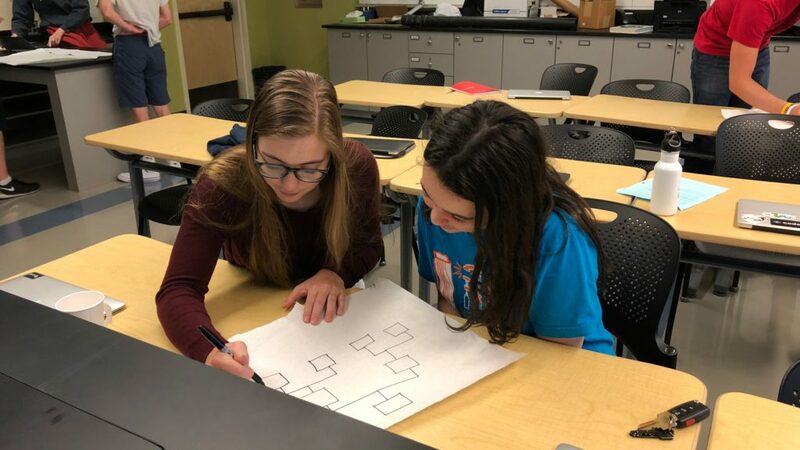 Small groups of students each create their own heap structure on large pieces of butcher paper, then go through the process of inserting a value and percolating, or deleting a value and percolating. Cries of “Wait, what are we doing here?” intermixed with “Ohhhhhh! Now I get it…!” A few minutes later, armed with a clearer understanding of the mechanics, they’re ready to turn to their keyboards. So, yeah, I’m that teacher now, the one with the butcher paper and the sharpies. And I’ve got some post-its in the cupboard, too, but I’ve got to draw the line somewhere. It’s Computer Science Education Week, and for the fourth year in a row I’ve conducted presentations at our Lower and Middle Schools for an Hour of Code with 5th and 7th graders. I’ve got a bit more on my plate than usual this year, so I tried to minimize time spent emailing/calling/coordinating with various administrators, tech coordinators, and teachers. I work with a great group of people who helped make some of that happen—our Middle School Tech Coordinator was instrumental in navigating some of that, and my Upper School director committed early to giving me time off from my classes to go conduct those sessions. Also, our Lower School Technology Integration Specialist took on some of the heavy lifting for the first time this year, identifying activities that might be well-suited for the 5th graders. I’d been a little smart about things too: the Hour of Code webpages that I’d set up previously were still live, and a handy reference for those who wishe it. The presentation materials that I’ve developed over the years were pretty much ready to go as well, with some minor modification and editing. I’ve been switching from PowerPoint to LibreOffice, and my software on the laptop was good to go. Now, how about that hardware? Every presenter has their list of hardware that they need to be sure to bring along to a presentation, particularly if you’re going to be away from your home base for the day/week. What to bring with? I’d been to one of the rooms I would be presenting in, and knew that it was probably already stocked with the various power supplies and cables that I’d need, but you never know. Most of the items on that list there are simply backups or replacements for items that I expect will already be there. 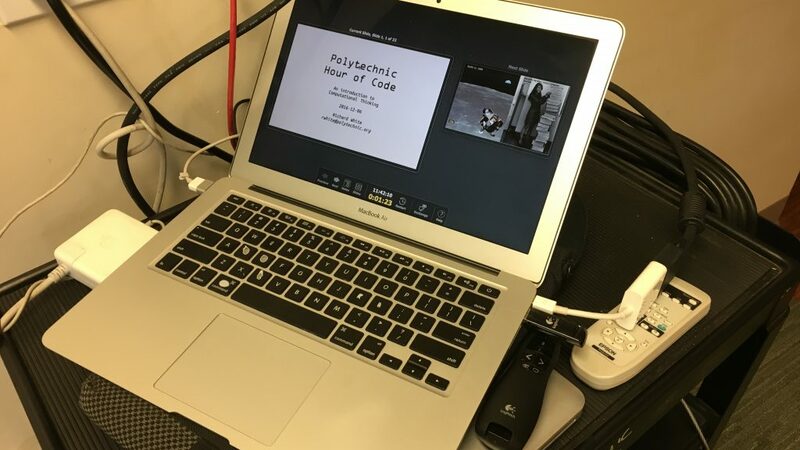 I got to the room, got things set up, checked out the projector to make sure it was working, double-checked the video that I’d be running in the presentation for sound… I was good to go! I went to grab a marker to write my name on the whiteboard… no markers? Oh, there’s one. An old low-odor marker for which someone has left the cap off. I tried to write my name, and it left a half-visible mark on the board. I went to erase it and… no eraser. Who has whiteboards with no working pens or erasers? I scrambled around a bit and managed to scare some up just in time for the presentation. I’m a classroom teacher, and I’m a busy man. I prep lessons, I develop and coordinate assignments for my students, and post homework assignments on the school website. I collect work, set up labs, write, administer, and grade tests. I develop caring relationships with my students. It’s the best job in the world… and I come home *exhausted* most days. One of the many challenges we teachers face is providing learning opportunities that are appropriate for the level of our students. In classes with an especially wide range of abilities, these can become problematic, logistically speaking. 1. students who have already had some experience with programming, possibly in a different language, and who are able to accomplish most assignments very quickly. 2. students who may be new to programming, but who are making reasonable progress. They quickly learn that programming requires attention to detail, and they typically pick up patterns—syntactical, logistical, procedural—after one or two exposures. 3. students who struggle to recognize the patterns, or who find themselves more easily frustrated by the puzzles posed by programming assignments. I’ve experimented with a few different strategies over the years. Here are three that I’ve tried that have met with some success. In this type of differentiation, students are provided with a text file (usually online) that contains a statement of the problem at the very top of the file. The file itself is actually a working copy of the problem, with the initial problem statement written as a multi-line comment near the beginning of the file. Much farther down on the page, where students can’t easily see it without scrolling, is another multi-line comment containing a pseudocode analysis of the problem. And finally, much farther down again, is the solution code itself. Students who want to work out the program without any hints are free to do so, while students who need a bit of help from the pseudocode can look at that as needed. Students who need much more support may find themselves looking at the actual program for assistance, and that’s okay if that’s where they are in their own learning process. 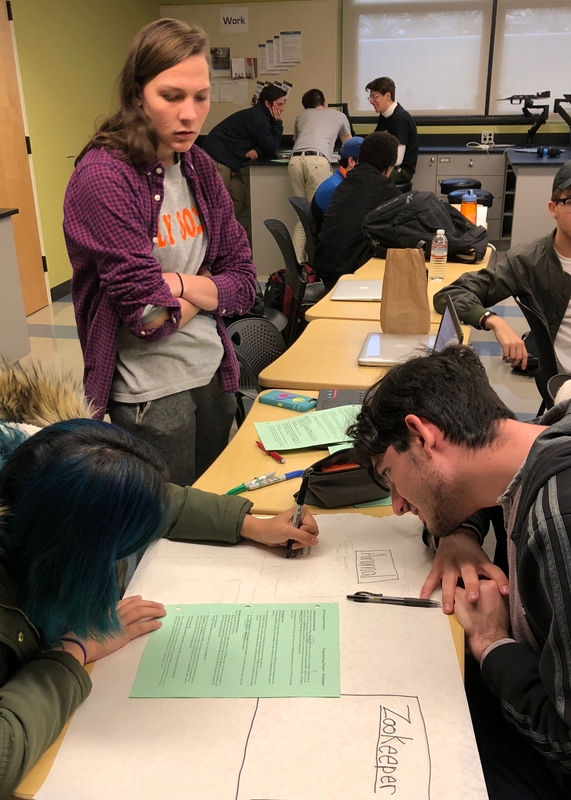 In this strategy, something similar to the “Below the Fold” method is used, but now, the problem statement and its solution are printed on paper to be distributed to the students. The front side of the paper has the problem statement, and a complete working version of the code is on the back side (page 2) of the same piece of paper. This has the advantage of giving the students a concrete document to scribble on, and giving the teacher some ability to see which side of the paper students are looking at as they work on the program. The final strategy is much more interactive. Students are assigned a problem in class and instructed to begin developing a solution. At the front of the room, after some reasonable amount of time has passed, the teacher begins writing out a rough outline of the program, perhaps with comments highlighting significant sections of code. Students who have developed their own solutions to the program will continue working on their own, while those who may be struggling to organize a solution will get some hints from what is written on the board.After a few more minutes have passed, the instructor may continue fleshing out the solution to the problem using the framework already developed. Students who still aren’t sure about some aspects of the program are free to ask questions as actual code is presented on the board. Strategy 3 requires the most from me in the classroom. I’m moving around the room, actively monitoring students’ progress, and trying to determine the *decisive moment* (thank you, Henri Cartier-Bresson) when I should begin reaching out to assist students who need some additional guidance. Strategies 1 and 2 have the benefit of being delivered by computer or paper, with assistance immediately available to students when they decided they want to take advantage of it. The downside of those two strategies, of course, is that students do have access to solutions, and may be tempted to avail themselves of those materials before they’ve had a chance to wrestle with the material… and it’s in that wrestling that they really get to learn things. As I say, I’ve used all three of these strategies on one occasion or another, and they work pretty well in Computer Science courses. I’ve adapted similar strategies to some of the science courses I teach. As a teacher, do you use any of these strategies, or something similar? How do you reach out to the students of varying ability levels in your classroom? I’m fortunate to work at a school where the faculty are very collegial. Even where there is occasional departmental or teacher-teacher friction, we tend, by and large, to get along. You might chalk it up to our “Welcome Back” and end-of-year dinner parties… or maybe it’s the post-faculty meeting margaritas that they serve us occasionally. Whatever the reason, I see a lot of personal and professional cross-pollination going on. This kind of networking requires both time and an individual willingness to be open: to people, experiences, and possibilities. I often find myself locked up with lessons to create, labs and projects I want to design, and always, always, a pile of papers to grade. Finding the space for interactions with others necessarily means setting some of my work aside, at least for a little while. This past August, for example, I should have been deep into prepping for the coming school year, but two of my English department colleagues had put together a weekend workshop on Transformative Teaching and Learning, to be offered at an open workspace in downtown Los Angeles. It was a great weekend with a diverse group of teachers, and if none of what we did was completely germane to my own subject area, I had the opportunity to reflect on other aspects of my teaching. Insert confused looks here from the Physics/Computer Science teacher. Huh. I’d never thought of that. Next thing you know, I’m minding his infant daughter at a nearby pub while he grabs a couple of beers for us, and before long we’ve launched into a conversation on the role of language in various contexts. … Richard White sees a similar form of authorship in his AP Computer Science classes, where students create their own programs through syntax and conventions of coding languages. Like seventh-graders writing haiku or ninth grade math students telling the story of their solutions, his students have an outcome in mind and must work within the constraints of a specific language or instruction set to achieve that outcome. But there is creativity within those constraints, and the outcome is not assumed. Sometimes when the program is run, it does the unexpected. These surprises are exciting moments for White and his students: Like authors discovering new meanings through the process of writing, they find that they have created new things that they never intended, and they are able to learn from them. Nathan makes me sound a lot smarter than I am, but I never turn down free publicity…! Teachers tend to get pretty busy, and it’s easy to find one’s self spending a lot of time alone, frantically trying to keep up with our obligations. We take our jobs seriously, and we have high expectations, of our students and ourselves. I believe that taking a little time off, however, benefits us in important and unexpected ways. Take a moment today or tomorrow to put your grading down, get out of your classroom or office, and stop in for a chat with someone. Go visit someone’s classroom for a few minutes. Check in with one of your admins. You never know what might happen as a result! I’ll confess right here, I’ve only really ever been a lurker on Twitter. I’ve got a couple of accounts there, and I follow a few people, and appreciate the spontaneous ebb-and-flow of some conversations, memes, tropes, movements, and revolutions. I’ve also watched in horror as a hashtag “blows up” while the Internet—bored, and starving for something, anything to frenzy-feed on—zeroes in on a statement taken out of context, an offhand comment that unknowingly became co-opted as a sound-bite for someone else’s rant or cause célèbre. I love the Internet and its nearly perfect ability to act as a vehicle for a truly democratic and representative communication tool… and Twitter has come to embody the very best and worst of that communication. At least part of the problem has to do with the simple fact that 140 characters, the limit on the length of a Tweet, is just enough to present a statement, and not nearly enough to provide context, support, or any significant development of that idea. Taking things out of context isn’t a problem unique to Twitter, of course, but the 140-character limit of the medium practically demands it. A quick, easy example: It’s not uncommon to hear a teacher at my school say of their students, “I love my students.” I have said, in chiding my students for a momentary lack of attention, said something along the lines of, “I love you guys, and I want good things for you. Let’s get back to work, shall we?” Is it a surprise to hear that teachers love their students? Of course not. Is that something that could be taken out of context on Twitter? Ummmmm, yeah. Of course it can. Steven Salaita, for example, had his tenure-track position at the University of Illinois Urbana Champaign rescinded after the university disproved of his tweets in support of Palestinians. But my takeaway from that experience and the experiences of others (see How One Stupid Tweet Ruined Justine Sacco’s Life, and Too Many People Have Peed in the Pool for two examples), is simply to not use Twitter. I have a number of other communications tools that I am free to use with friends, family, and co-workers, and I have no need to recruit followers, nor to deliver pithy, entertaining, or even useful comments to the universe. Some educators may find that tweeting is a rewarding experience, and I absolutely do enjoy reading the tweets of some of my colleagues. For myself, however, I find the personal / professional risk of tweeting to be unacceptably high. Former MLB pitcher and current ESPN baseball analyst Curt Schilling was reprimanded by the network after posting a questionable meme on Twitter. On Tuesday morning, he tweeted a meme featuring an image of Adolf Hitler with the words: “It’s said only 5-10% of Muslims are extremists. In 1940, only 7% of Germans were Nazis. How’d that go?” Schilling added his own commentary, the Los Angeles Times reports, writing, “The math is staggering when you get to the true #s.” He deleted the tweet 10 minutes later. Not long after, ESPN announced he would no longer be covering the Little League World Series. “Curt’s tweet was completely unacceptable, and in no way represents our company’s perspective,” the network said. “We made that point very strongly to Curt and have removed him from his current Little League assignment pending further consideration.” Schilling returned to Twitter to take responsibility, writing, “I understand and accept my suspension. 100% my fault. Bad choices have bad consequences and this was a bad decision in every way on my part.” The lesson here is simple: Don’t use Twitter. Do you use Twitter? Do you use it in your capacity as an educator? In which direction does the Risk/Reward balance tip for you? You’ve almost certainly heard of Maslow’s Hierarchy of Needs, which describes five levels of needs, in ascending order, that lead toward fully realizing one’s human potential. 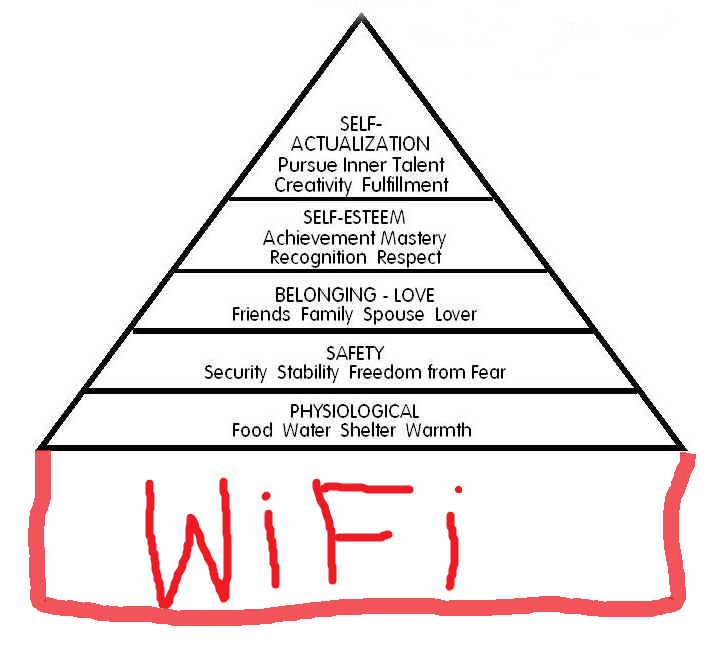 Those needs are summarized in the triangle below, with an important addition at the very base of the pyramid, courtesy of the Internets. It’s funny in part because it’s true, at least as far as educational technology is concerned: if you don’t have a wireless signal at your school that students can use to access the Internet, well… it’s going to be pretty hard for you to do anything technology-related. And depending on your classroom setting, the hardware issue may already be solved: your students are in a 1-to-1 program, or a Bring Your Own Device program… or maybe you’ve got a critical mass of smartphones that some of your students already own. There are lots of ways this could work out. And from there, it’s up to you, you and the students, what you want to do with this technology, and how you want to leverage it. Web-based research assignments? Shared Google Docs (either via Google Apps for Education or students’ private Google accounts) for students submitting cooperative work? Web pages? Mobile apps? 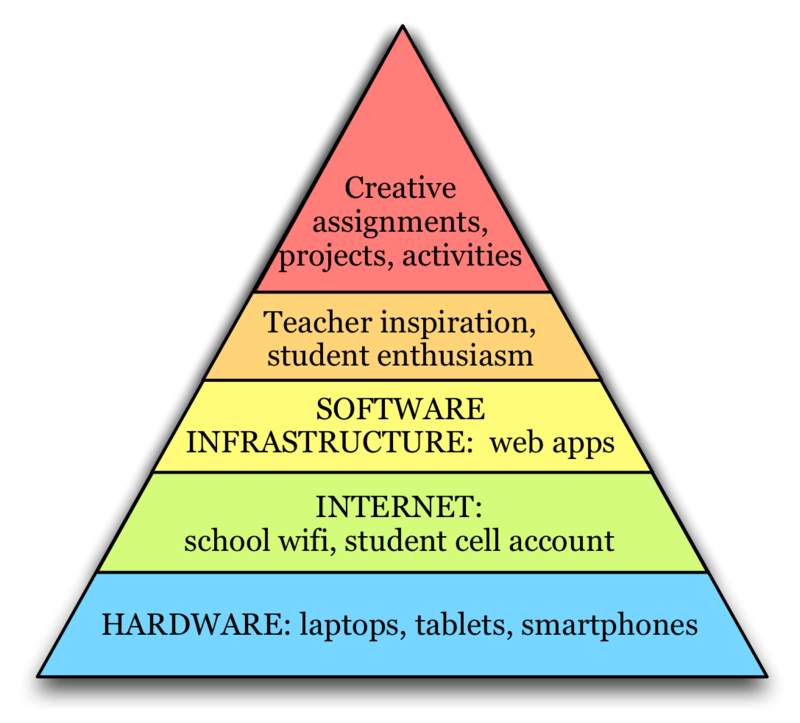 With apologies to Maslow, then, here is an update Hierarchy of Needs for Educational Technologists. There are thousands of technology-facilitated things you can do in the classroom, but it all begins with a device and a connection to the Internet. There are perhaps a few elements missing here: administrative support for new ideas, new hardware, or new software? And certainly professional development funding/time for inexperienced teachers is always needed. What else have I missed? Or are these really the essentials that are needed for successful deployment of Educational Technology at a school? More videos, in support of Poly’s new Bring Your Own Device program for 9th graders this year. At Laura Holmgren’s request, last spring I wrote what became the inaugural post at poly360.org, a blog for the independent school community in which I work. I’m fortunate to work in a community where the topics covered in that post are actually part of ongoing, day-to-day discussions I get to have with other teachers and technologists. I’m cross-posting the piece here. When I was nine years old I read Danny Dunn and the Homework Machine, a story in which Danny and his friends Joe and Irene program a computer to do their homework for them. At that time the personal computer was still a fantasy, but the possibility of being able to have a machine handle my academic chores–my learning–was absolutely intoxicating. I began investigating the possibilities of technology-enhanced programmed instruction. The learning process for an inspired student can be a pretty straightforward process: get exposed to something new, learn a little bit about it, and then use what you’ve learned to do something interesting. For some subjects, the process of presenting information and checking for understanding is ideally suited for a computer, and I wasn’t the only one who thought so. Programmed instruction in book form had existed for years, and computer-based math instructional methods were already being launched. I was a month or so into developing my own programmed instruction when I began to realize that this system, whatever its benefits might be, also had the effect of isolating me from the very best part of my vocation: working with students to help them understand the world around them. Teaching content, exploring with students the process of interpreting content, and perhaps most importantly, learning to develop strategies for dealing with new and unexpected situations, all demand a dynamic, creative, process that is the very heart and soul of my work. There was no way for me to write this stuff down, to program it, to “classroom flip” this aspect of my work. That hasn’t kept me from leveraging technology where appropriate. The vast majority of my current curricular materials are online–lessons, labs, homework help, and practice tests–and students across the U.S. and abroad use these materials as a guide in their own learning. I am part of a global learning and teaching community, using technology that is faster, cheaper, and better than ever. We are actively exploring new ways that we can use that technology to improve education. 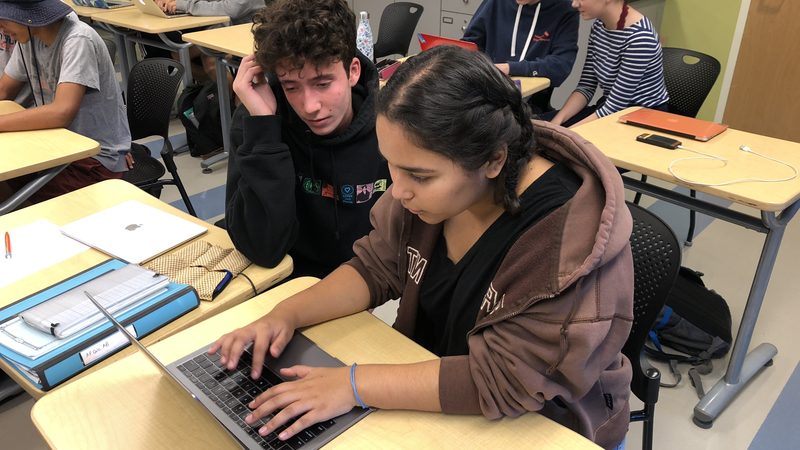 But at the heart of it all–sometimes just barely visible behind the iPads and the laptops, the email and the tweets, the websites and the Massive Open Online Courses–are students and teachers, working together, just as we always have. And there is nothing that will be able to replace that. I’ve been wanting to write for a long time about the challenges that technology users face in some schools, in some rooms, in some educational cultures. It’s something that we all face on occasion, from a colleague who “doesn’t really do technology” to a school leader with an uninformed knee-jerk reaction to social networking, from infrastructure that is unable to support the increased hardware and bandwidth demands of a classroom to pure, simple, reluctance to change… being on the leading edge of technology-based education reform—and worse, being on the bleeding edge—is not for the meek. You can insert your favorite Don Quixote quote here if you like. A little bit of a wildcat mentality may come in handy if you’re more gung-ho than your colleagues, administration, or school is currently willing to support… and dare I say it, a little bit of cash. When LCD projectors first dropped to the barely-sub-$1000 price range a few years ago, both I and a colleague of mine each bought one. It’s not that we had loads of cash lying around; it’s just that we were *that* committed to trying to transform the way we were doing things in the classroom. If your school can’t buy you a computer that meets your needs, try to beg, borrow, or buy one that will. If a decent backup strategy for your computer isn’t currently available to you, buy a service, or get an external hard drive, or learn how to roll your own backup strategy on a friend’s server. If your kids don’t have “clicker”-style Classroom Response Systems, get a set of whiteboards and dry erase markers that they can use to record their responses for display to the instructor. If your school blocks YouTube, use a video downloader plug-in like Flash Video Downloader to pull down the video locally onto your computer and show them from there. The point is obviously that there are almost always options. We just need to be creative. It’s a jungle out here, and we’re all looking for ways to survive. It’s okay. We signed up for this. We can deal with it. I stumbled upon this post a couple of days ago, which is a nice reminder of how we sometimes need to do things a little differently. It comes from the Business section of Wired Online, but I think it’s got a lot of relevance for educators as well.